Introducing the Fontlove Studio Specimen Catalog! We are very pleased to announce the release of a project that has been many months in the making – a printed specimen catalog of our type collection, available here at the studio or in digitized form online. We started this project to provide a useful tool for our clients and students, a resource that allows them to see printed samples of the wood and metal fonts available for use. Anda Tanaka, the intern in charge of the specimen catalog, elevated this practical goal into true art – using creative layouts, bold color and of course a hefty number of Minnesota-themed puns! Go ahead and browse the specimen catalog, and read this interview with Anda to learn more about the process! Q: How did you decide on a format and overall design for the specimen catalog? What were some of your inspirations? What were your constraints? A: The format and design evolved throughout the process. At the beginning, I just dove in feeling like I didn't really know what I was doing, but pulling that first proof of Bodoni Ultra was great and I started feeling more confident and creative. I was inspired by a set of old traveling salesman type specimen cards which I found to be very easy to shuffle through and aesthetically pleasing. I also used my favorite visual research tool, Pinterest, and looked at design portfolios to help me decide how the specimens would be presented. The loose leaf format allows clients or students at Fontlove to pull single pages for reference. My biggest constraint was dealing with limited spacing. Luckily I am patient, so I wasn't too bothered by stacking all of the 12 pt spacing when I ran out of 24 pt. Another constraint was dealing with a few incomplete fonts, which limited which example word or phrase I could use on the specimen. In general, I feel the constraints involved in letterpress printing encourage me to be more creative. Q: How did you approach each specimen? What steps did you take? A: My first step was always to come up with a Minnesota-themed word or phrase for the specimen. I had a big list of words and categories made up before I started, so I had that to reference for inspiration. Next I sketched out an idea and then started setting type and playing around with the spacing and overall shapes of the bodies of type. After locking up, I proofed the specimen and then wrote out all the corrections on the proof. Once happy with the proof, I printed an edition of 30 prints per font. Q: What were one or two of the biggest challenges? A: Probably the biggest challenge was feeling confident enough to take ownership of the project. 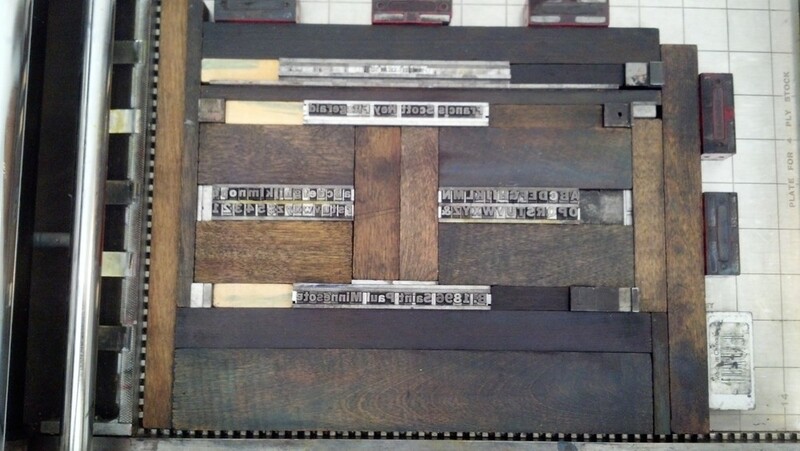 I have done a lot of printmaking, but before interning at Fontlove, not a lot of type setting. Additionally, I was nervous to be the main designer on a piece that helps to represent a business that I didn't yet know well. At the beginning I asked Elana for a lot of advice and affirmation, but as I got more comfortable with letterpress printing I started feeling like I could take more control. By the end of my internship, I gained confidence and had a lot of fun coming up with creative type layouts. Q: What did you learn about the differences in fonts and fonts sizes and how they are best used in different situations? A: The most visual representation of this are the specimens that include two fonts that are the same size. A delicately formed font looks almost like a different hue than a bolder font the same size placed next to it. I also found that there are some fonts that just print better (clean edges, well-spaced) and I would choose these fonts for big editions for ease of printing. After helping out with a class, I learned that it might be best in that situation to lock all the drawers with fonts smaller than 36 pt! Q: What did you like about the process? A: To love printing, you have to love process. Working on this project, I felt like there was a good balance between problem-solving tasks and repetitive tasks. There was the challenge of designing and locking up the piece paired with the meditative repetition of printing. 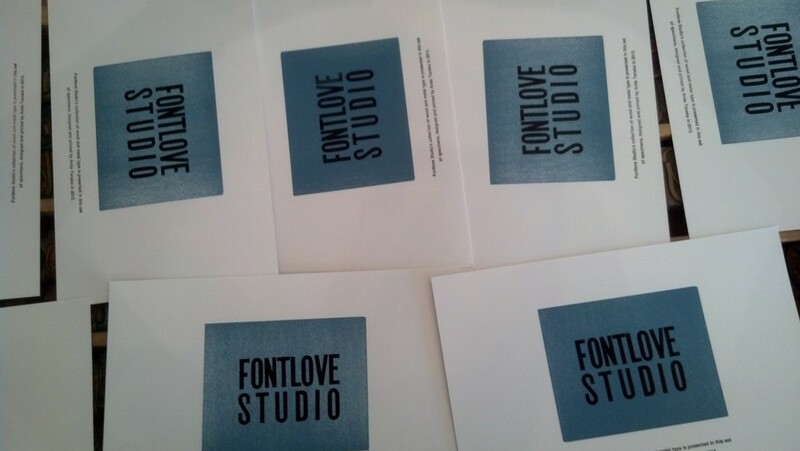 I enjoyed spending whole days at Fontlove in the printing zone, smelling ink. Then, when I helped with a class at Fontlove I got to see students using the specimens to help them make design choices. That really brought the project to a satisfying end.